Not sure where the name for this group comes from, although it may be due to the fact that the leader of this congregation of Brooklyn-based musicians is Canadian. Whatever the case, this set of seven tunes all with brilliantly wacky titles, like "Innuendo is Nobody's Friend," "Sympathy Barters No Parsnips," and the multi-sectional piece "We All Ate What We Wanted To Eat" parts 2, 5, 3 and 1 (yes, presented out of sequence!) 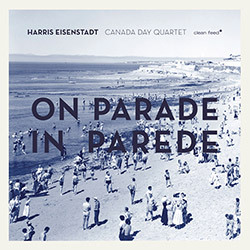 is a great listen, both for the writing by drummer-leader Harris Eisenstadt and for the creative playing by all involved. It is especially a treat to hear Nate Wooley on this session. The trumpeter is always fascinating for his extended techniques and hard-core physicality of sound, but here, following some of the orders from the control center that is Eisenstadt's compositions, Wooley comes off as the Bill Frisell of the trumpet, bringing out the singing lyrical potentialities of the composer's melodies. Saxophonist Matt Bauder blows a mean tenor with a sound seeped in the traditional jazz language, clearly, but digging into the music at hand with the raw verve and panache required to pull it off. The same and more can be said for bassist Pascal Niggenkemper whose tight complicity with the drummer-leader is a big reason this session cooks. The compositional style of the material at times reminds one of Ted Sirota, another drummer-composer, but that may just be the nature of the beast, where rhythm reigns supreme as organizing principle and shaper of the vehicles. That makes for some very swinging music, but music that also takes the time for nuance. That nuance is the result of a blend of extended techniques and melodic, lyrical playing, getting into the song, and just moving the music forward. Tracks with particularly compelling interest are "Sympathy Barters No Parsnips," which starts with a long sequence of quietly smeared trumpet and evolves into a state-of-the trumpet-art solo, what with the variety of sounds Wooley works with. It then steps into the regal ensemble tune. Also of note is the crisply punctuated "We All Ate What We Wanted to Eat: Part 3" and the soulful "Part 1" that closes the live set recorded in the Portuguese beach town of Parede.